OK, so, this post isn't about any of the eight games on the Tuesday night NBA schedule. But when someone has reportedly scored 113 points in a single game, someone has reportedly scored 113 points in a single game, and so we write about it. 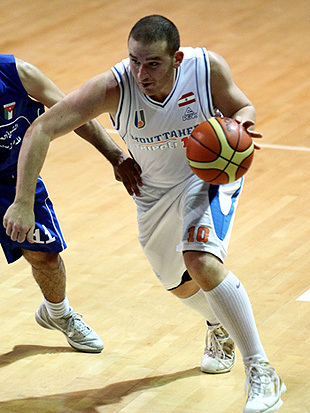 As the story goes — and, to be honest, we're having a tough time processing it ourselves, especially without video of some made shots — the 27-year-old Akkari, who had averaged just 7.6 points per game in the 23 games he'd previously played for Tripoli basketball club Mouttahed this season, scored 113 points on 40-of-69 shooting in a 173-141 win against Bejjeh in a Lebanese Division A League game. That total, which reportedly includes a ludicrous 32-of-59 mark from 3-point land, would FAR outstrip every single-game mark in the history of FIBA competition. Reached for comment on the prospect of bringing Akkari stateside, the Charlotte Bobcats said they had no interest in signing him, citing "tanking" as their primary reason. Oh, crap, was that supposed to be off the record? Akkari reeled in an incredible 32 three-pointers out of 59 attempts in an overall 40/69 field shooting and a solitary free-throw. "Thank God for this performance. I think it's all a result of my practice," Akkari said from [the] team bus on his way back to Tripoli. Akkari's American teammate Austin Johnson too was all praise for him. "He was awesome tonight. He starting out shooting the ball very well and just continued to go. Our team realized that he was on fire so we kept feeding him the ball. Congrats to Akkari on a record-setting night. He deserves it from the way he works and stays focused," Johnson said. But in the pro ranks? In a league co-signed by the organization that defines the international rules of basketball as they're deployed today? There, apparently, Akkari stands alone. By dint of having scored 113 points in a single game. OK: All of this sounds insane. That point total — let's take a look again: 113 points — would be ludicrous for even the biggest, baddest, most imposing forces in the history of the professional game in any league or nation, even adjusting for the quality of competition he'd face. For a player who stands 6-foot-4 to post that kind of number seems like an alternate reality in which the Scarlet Witch eliminated mutation or something. And yet, this is the world in which we find ourselves in April 2012. Hallelujah. Holy [EXPLETIVE]. Hat-tip to ESPN.com's Chad Ford. * As has been noted by multiple BDL commenters, Mohammad El-Akkari and Mustpha El-Akkari are brothers. Mustapha attends BYU-Hawaii, where he was recently elected student body president. I regret the error. ** As has been noted by multiple BDL commenters, Akkari's performance isn't the first instance of a player scoring 100 points or more in a single game in international competition — 100-point games have been posted in Croatia, Yugoslavia, the Philippines and elsewhere. The all-time scoring list in FIBA-associated competition included in FIBA's archives, however, does not include any 100-point games.